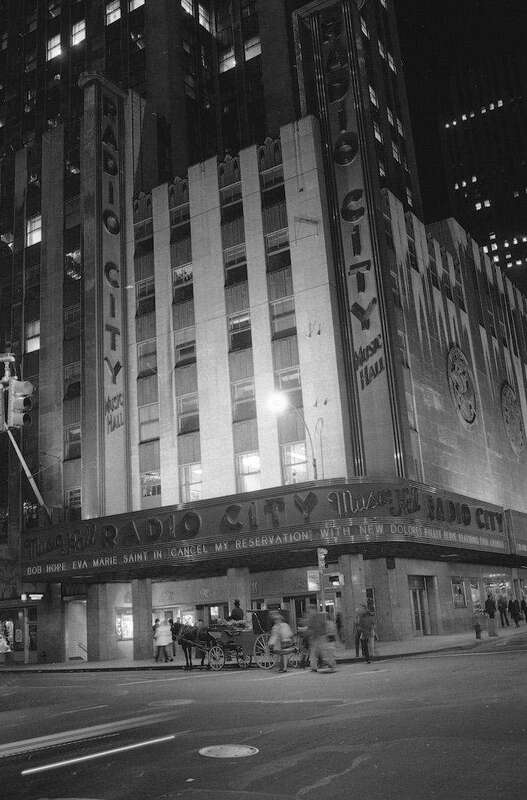 Take a look at Rockefeller Center's Radio City Music Hall from its opening on Dec. 27, 1932, to today. 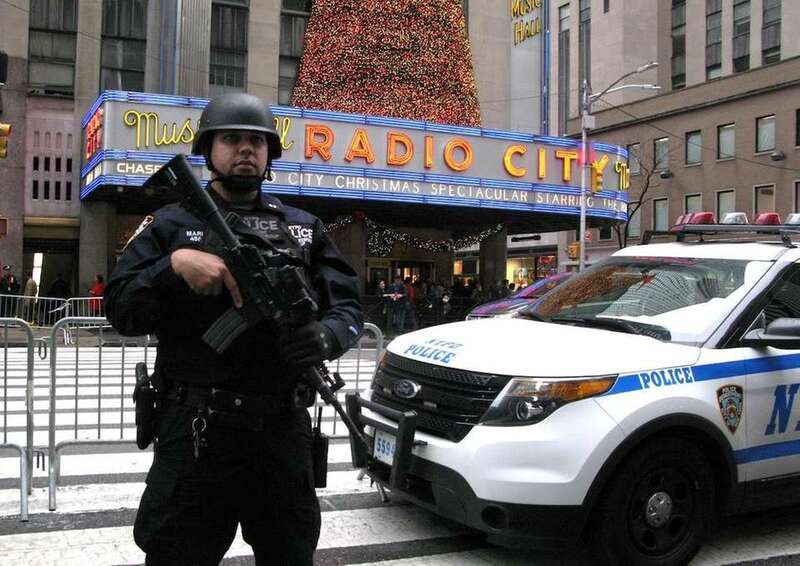 An NYPD officer on guard near Radio City Music Hall on Dec. 24, 2015, in Manhattan. 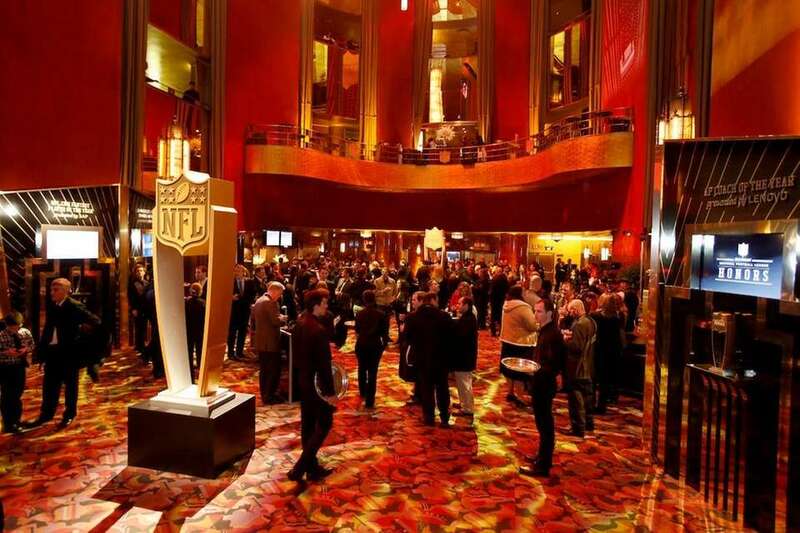 The scene at the 3rd annual NFL Honors at Radio City Music Hall on Saturday, Feb. 1, 2014, in Manhattan. 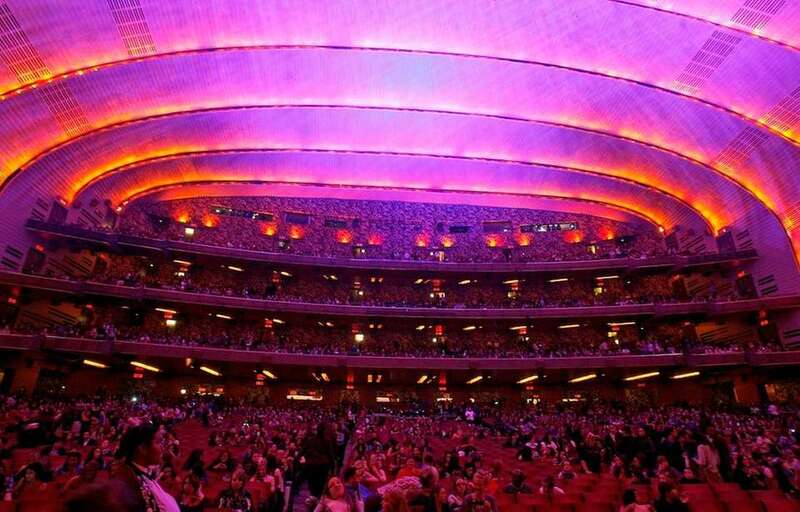 Radio City Music Hall before the Jonas Brothers perform on Oct. 11, 2012, in Manhattan. 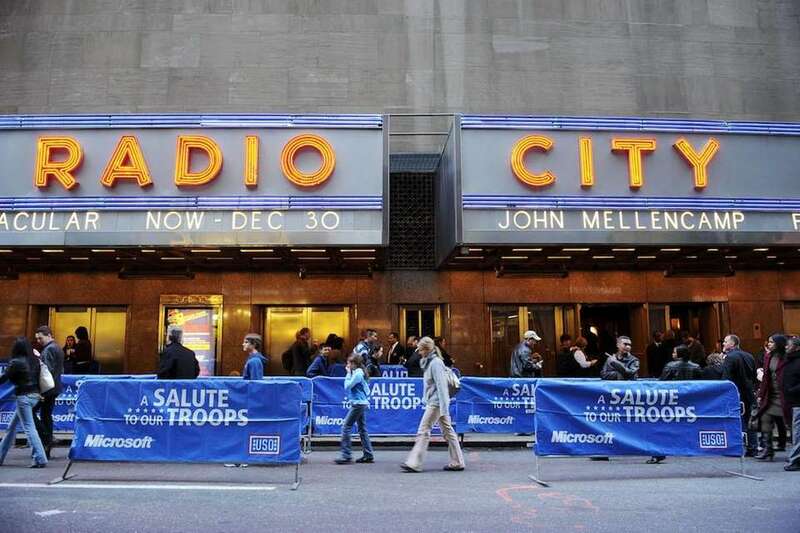 A general view of atmosphere during Microsoft and the USO's A Salute to Our Troops at the Radio City Christmas Spectacular at Radio City Music Hall on Nov. 13, 2010, in Manhattan. 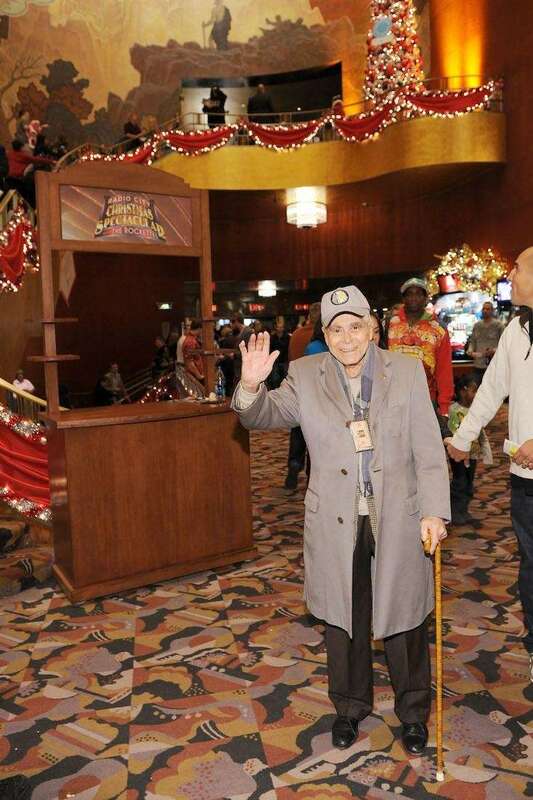 Veteran Jerome R. Richard at Microsoft and the USO's A Salute to Our Troops at the Radio City Christmas Spectacular at Radio City Music Hall on Nov. 13, 2010, in Manhattan. 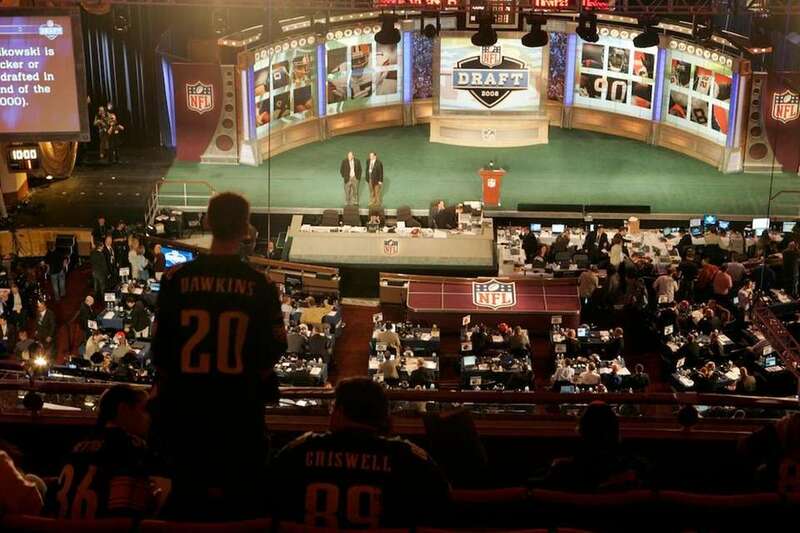 Football fans wait for the start of the NFL Draft at Radio City Music Hall in Manhattan on Saturday, April 25, 2009. 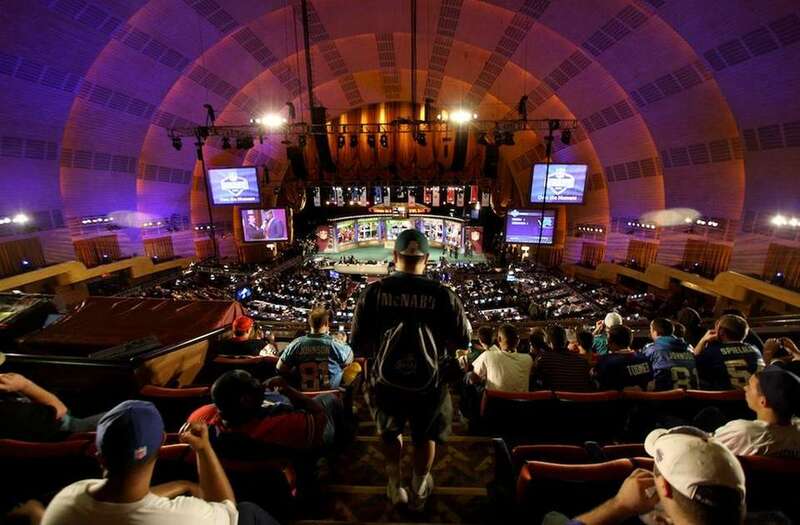 Fans watch the NFL Draft on stage at Radio City Music Hall on Saturday, April 26, 2008, in Manhattan. 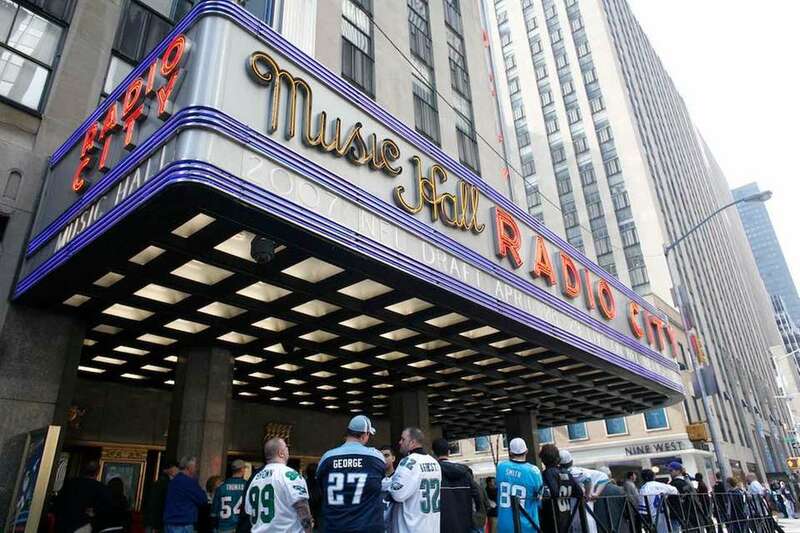 Fans line up outside Radio City Music Hall before the 72nd NFL Draft on Saturday, April 28, 2007, in Manhattan. Saela Chin, a member of the Radio City Rockettes, models a new costume as other Rockettes practice for the new season on Thursday, Oct. 27, 2005. 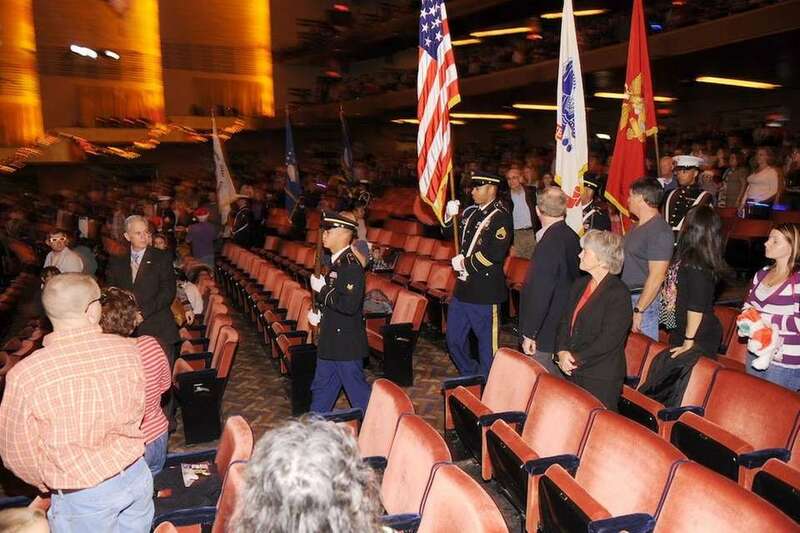 Musicians for the Radio City Music Hall's famed "Christmas Spectacular" went on strike on Wednesday, Nov. 2, 2005, the day before the show was set to open. 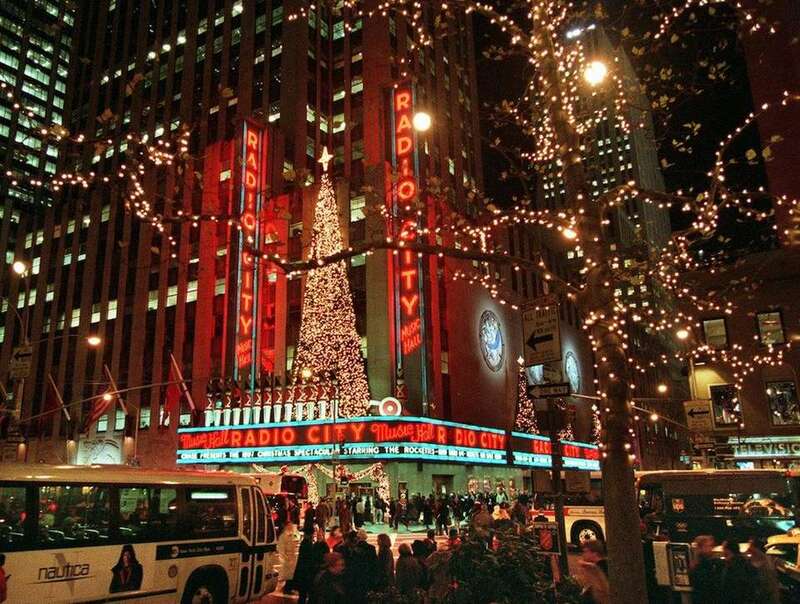 Christmas trees and other decorations sparkle on Radio City Music Hall, ready for its annual "Christmas Spectacular" in midtown New York on Nov. 6, 2001. 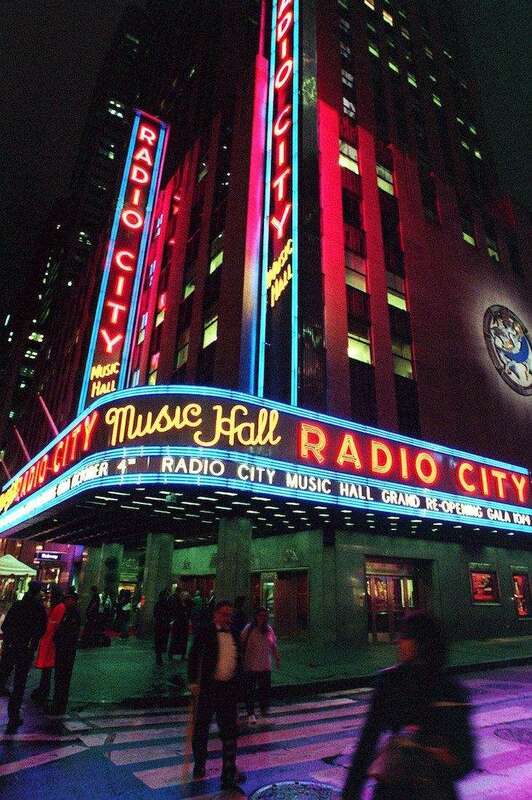 Radio City Music Hall announces its grand reopening in New York on Monday, Oct. 4, 1999. 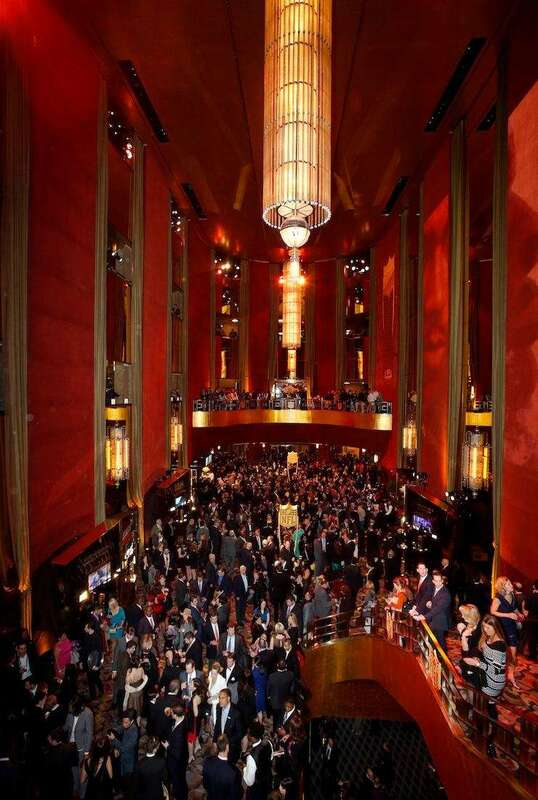 The renovated concert hall celebrated its reopening after a seven-month, $70 million restoration project aimed at returning the Manhattan landmark to its 1930s Art Deco splendor. 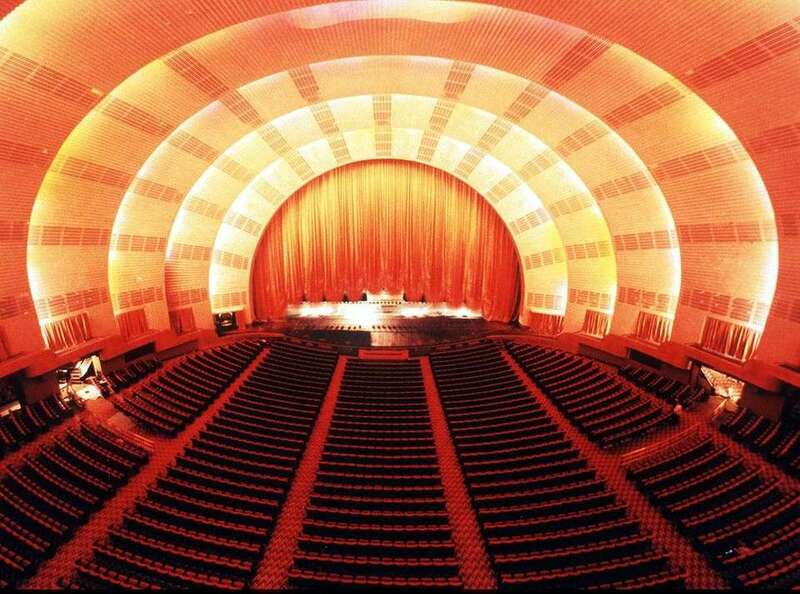 The interior of New York's fabled Radio City Music Hall is shown in this undated handout photograph released Friday, Oct. 1, 1999. From its 3,000-pound gold silk curtain and scalloped sunburst ceiling to Depression-era artwork that has been hidden for decades under layers of grit and grime, the New York landmark visited by millions each year has been restored to its former Art Deco grandeur. 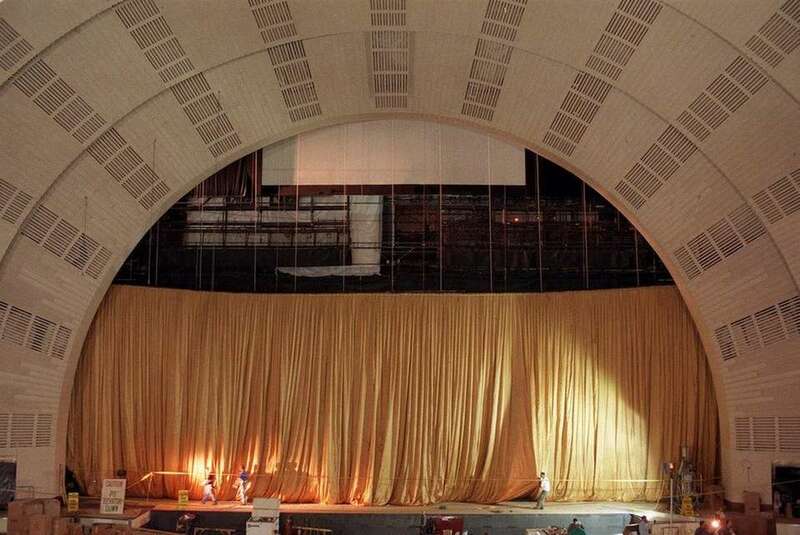 Workers adjust the folds of the new stage curtain as it is raised at New York's Radio City Music Hall on Thursday, Sept. 2, 1999. 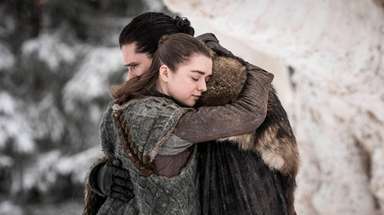 Two thousand yards of gold silk were delivered in three pieces to the concert hall where it was sewn together on stage to create the 2-ton, 78-foot high curtain. Members of the Australian music and dance group "Steel City" use a New York City taxi as a stage as they promote their upcoming engagement at New York's Radio City Music Hall on Oct. 29, 1998. 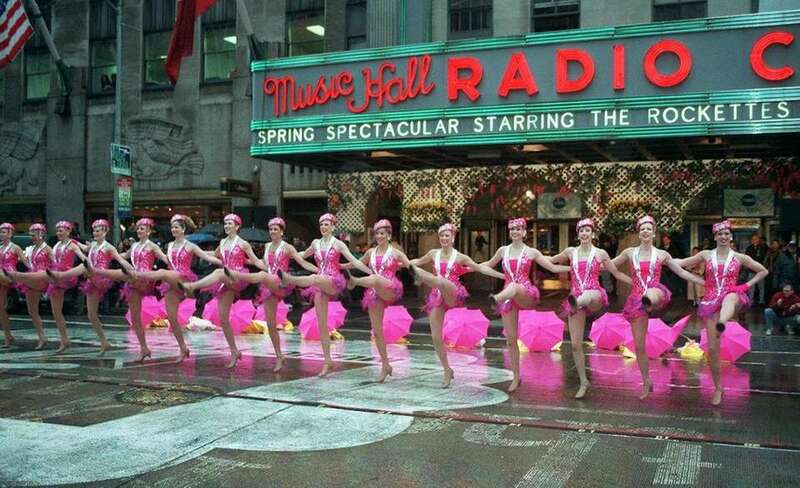 The Radio City Music Hall Rockettes use their signature kick-line to stop traffic on New York's Sixth Avenue to celebrate the first day of spring on Thursday, March 20, 1997. Buses and tourists fill the corner of 50th Street and Sixth Avenue on Monday, Dec. 8, 1997, in front of Rockefeller Center's Radio City Music Hall where the Rockettes are featured in the annual Christmas Show. 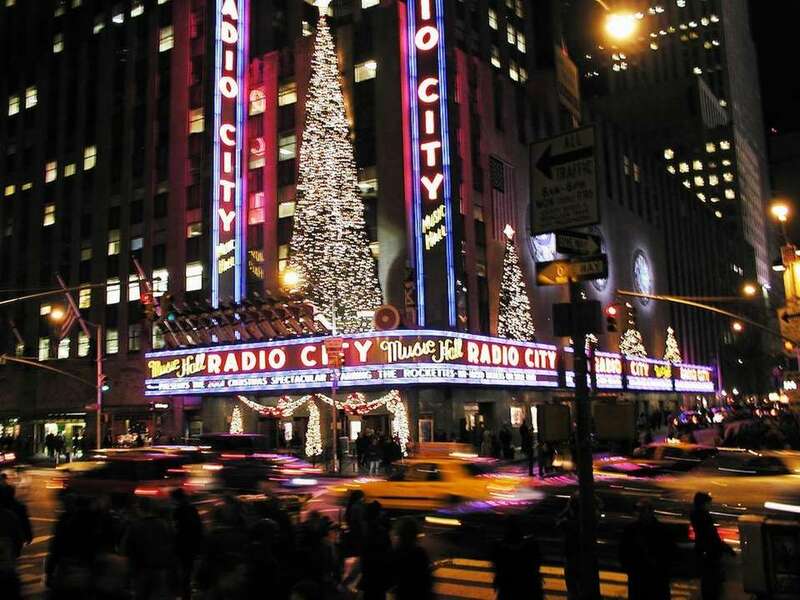 Radio City Music Hall is one block away from the center's famous Christmas tree, a magnet for tourists which seems to be the epicenter of a Christmastime crush in which every inch of Big Apple sidewalk seems to be taken up by turtle-paced tourists. 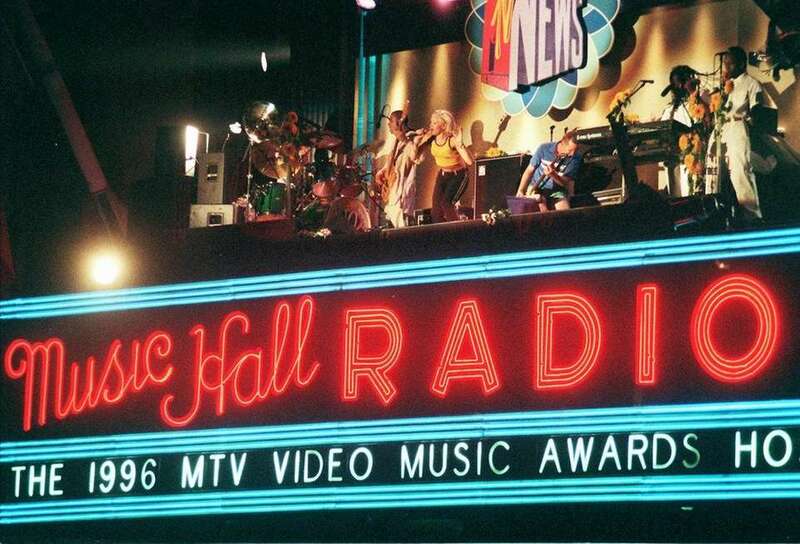 The band "No Doubt" performs atop the marquee of New York's Radio City Music Hall on Wednesday, Sept. 4, 1996, prior to the start of the MTV Video Music Awards. The Radio City Rockettes do a high-kick line on the Music Hall stage during rehearsals for the 23rd annual Daytime Emmy Awards show in New York, on Tuesday, May 21, 1996. 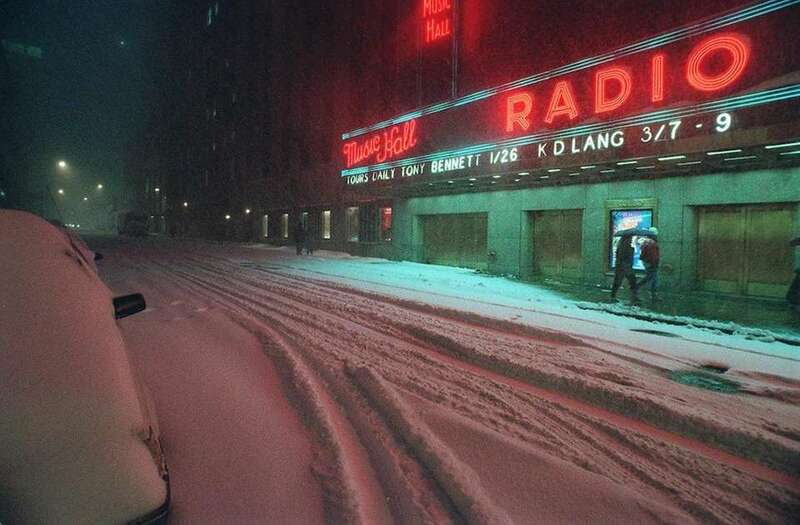 Radio City Music Hall provides the backdrop for the snow-covered empty streets in midtown New York on Sunday, Jan. 7, 1996. 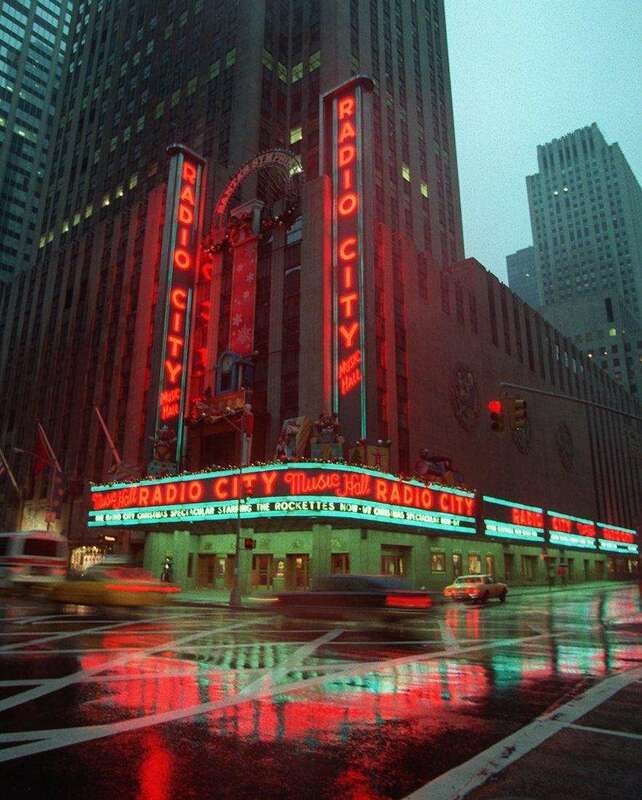 The lights of the Radio City Music Hall's marquee are refelected by a wet Sixth Avenue in New York in the dawn hours on Thursday, Dec. 14, 1995. 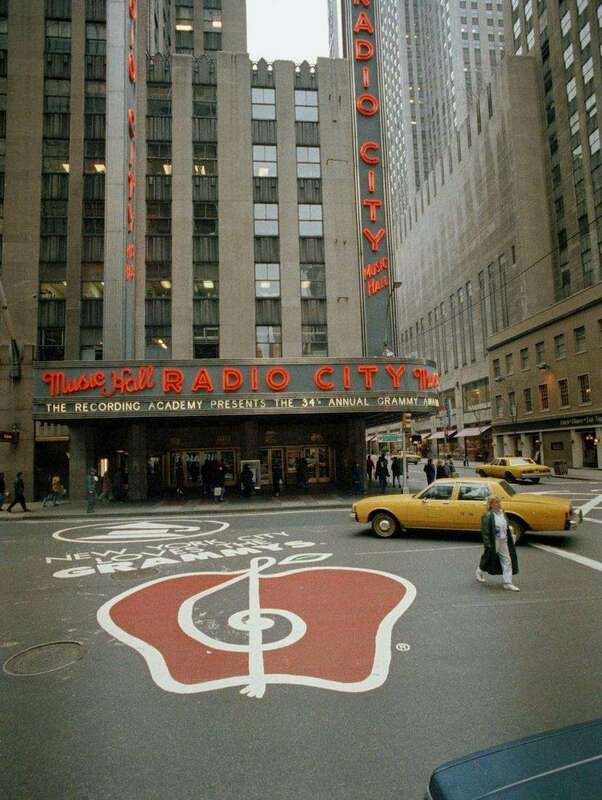 A red apple musical logo on Sixth Avenue in front of Radio City Music Hall on Feb. 24, 1992, to promote the 34th annual Grammy Awards, hosted by actress Whoopi Goldberg. Radio City Music Hall pages, from left, Eric Reynolds, Joyce Williams and Thomas Fitch, show off their new uniforms outside the theater on Oct. 21, 1991. The new look, replacing the brown uniforms cut in the style of regular suits, is part of the landmark theater's 60th anniversary celebration. 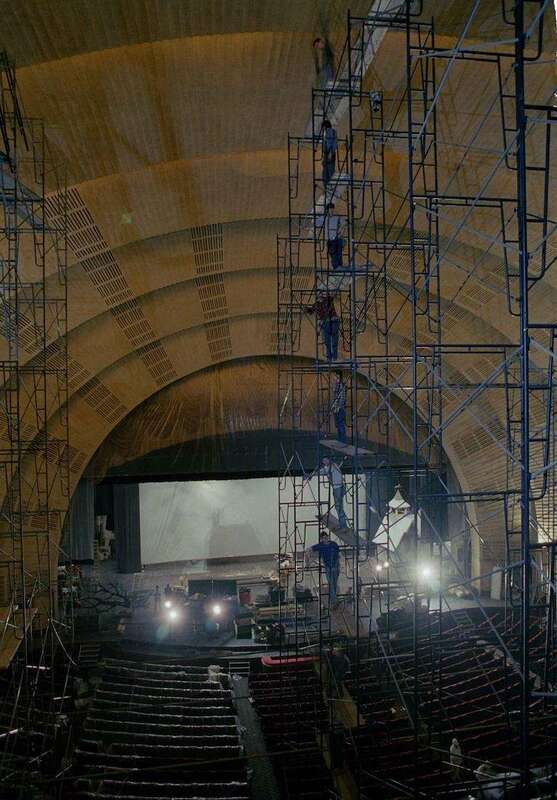 Work crews dismantle scaffolding in Radio City Music Hall after repainting the ceiling on Nov. 2, 1988. The 6,000-seat art deco theater's ceiling was completely repainted in five days. 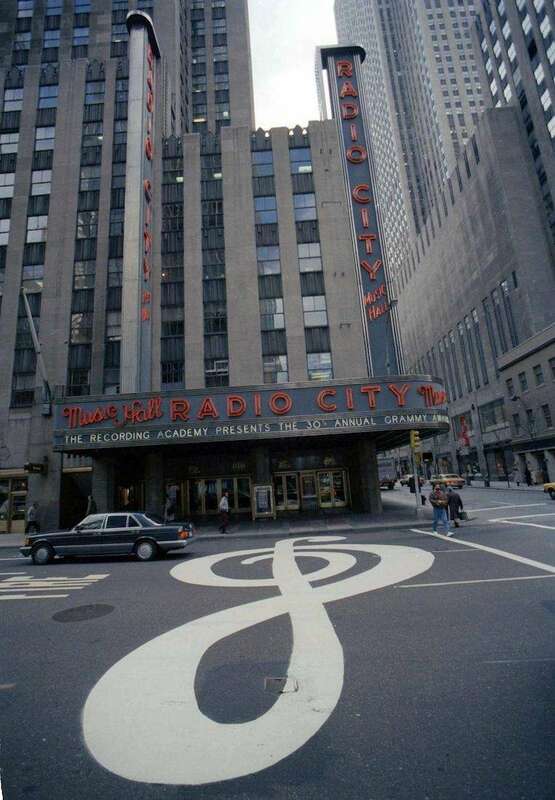 A gigantic G clef decorates Sixth Avenue in front of Radio City Music Hall on Feb. 24, 1988. The musical symbol was painted to promote the upcoming Grammy Awards to be held on March 2. Several notable artists in a rehearsal for "Living the Dream," a tribute to the Rev. Martin Luther King Jr., at Radio City Music Hall on Jan. 20, 1986. 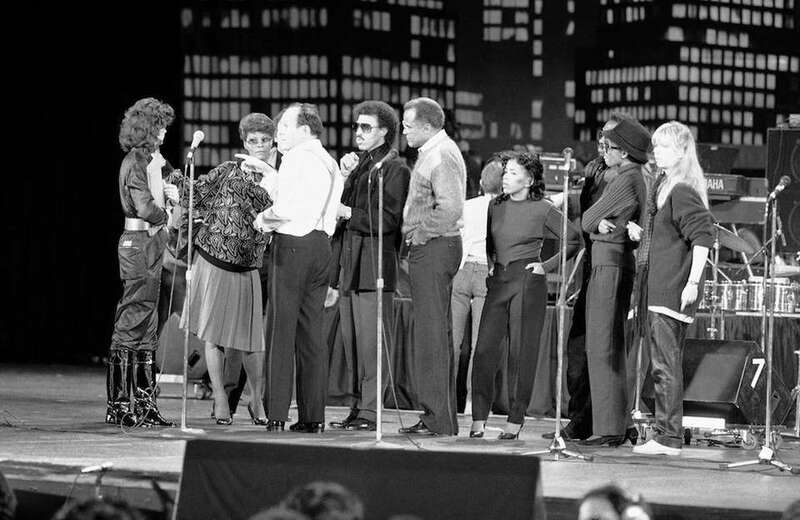 They are, from left, Dionne Warwick, an unidentified director, Lionel Richie, Harry Belafonte and Valerie Simpson. 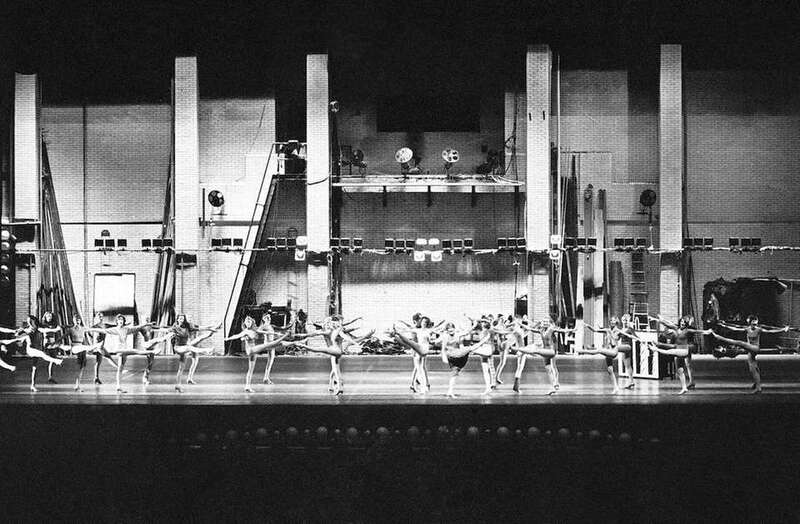 The Rockettes perform a number depicting a backstage rehearsal at a celebration for Radio City Music Hall's 50th anniversary on March 27, 1982. 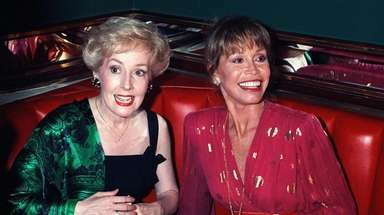 The number was part of a five-hour program of some of the showplace's most rousing productions of the past five decades, attended by a glittering black-tie audience. 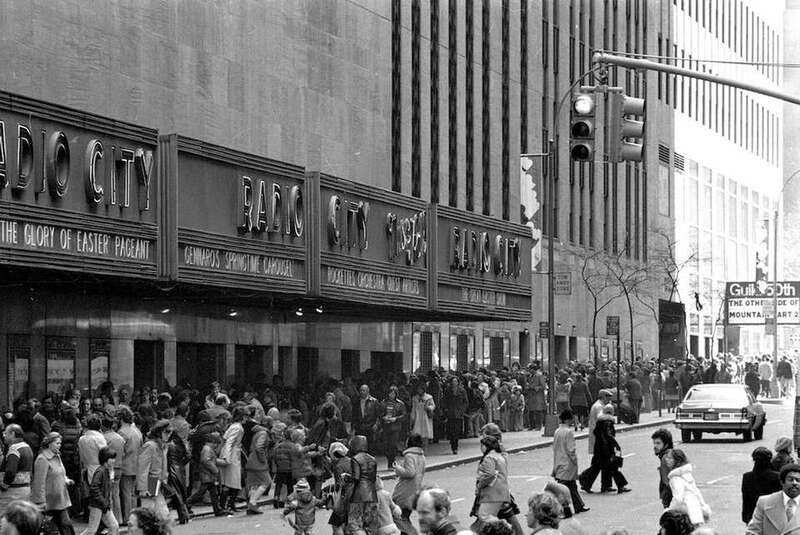 Long lines stretch around the block for Radio City Music Hall's Easter show on March 24, 1978, which at the time was seen as possibly the last event before the famed hall would shut its doors to the public. 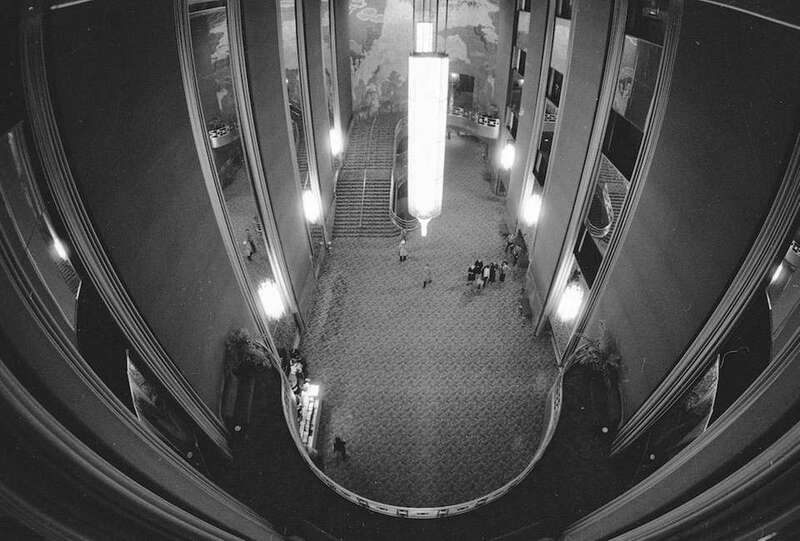 The main foyer of Radio City Music Hall on Jan. 16, 1975. 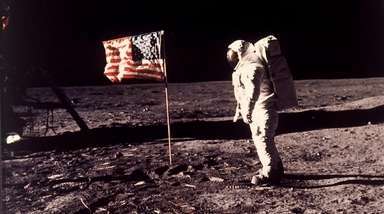 The theater's policy mixes a 43-year tradition of movies with stage shows and periods devoted to other attractions. 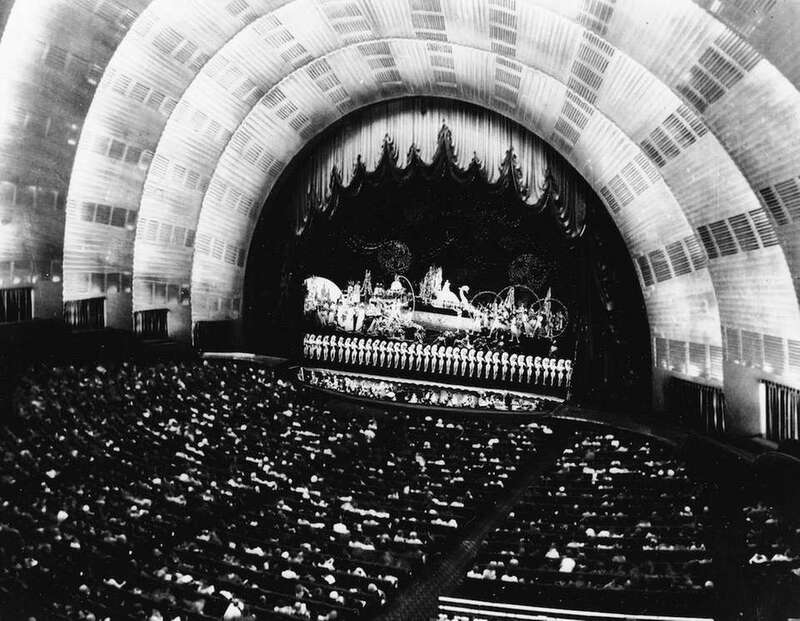 A spokesman for Rockefeller Center's Radio City Music Hall, seen Oct. 11, 1972, said at the time that the hall was closing due to a wage dispute with its musicians and that there was little chance it would open again. 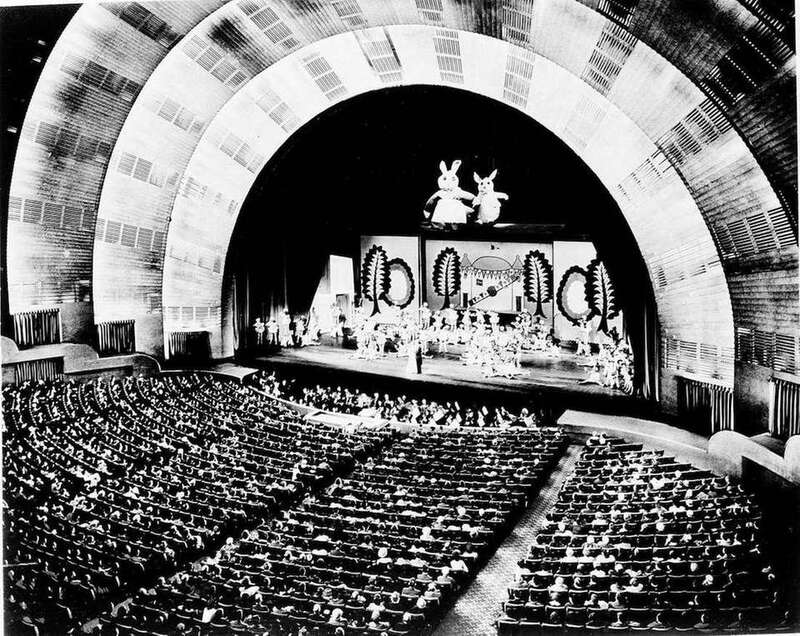 The unique art deco auditorium of Rockefeller Center's Radio City Music Hall, the world's largest theater with a 60-foot-high proscenium arch, and a full city block in width, seen in 1968. The symphony orchestra is in the pit. The theater seats 6,200 people. 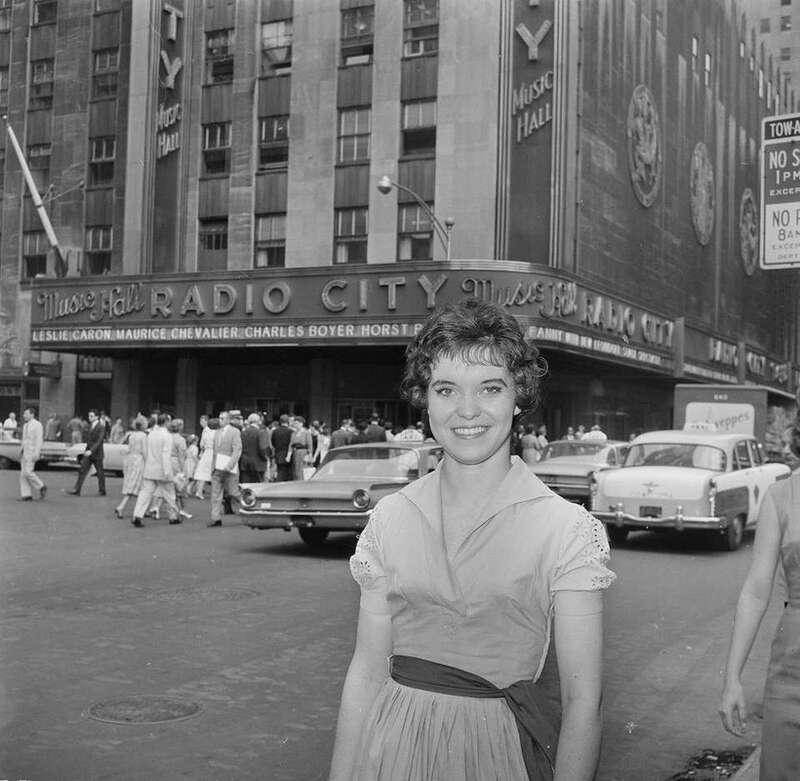 Joan Sheary of Worcester, Mass., a member of the Rockettes precision dance team at Radio City Music Hall, outside the theater in July 1961. 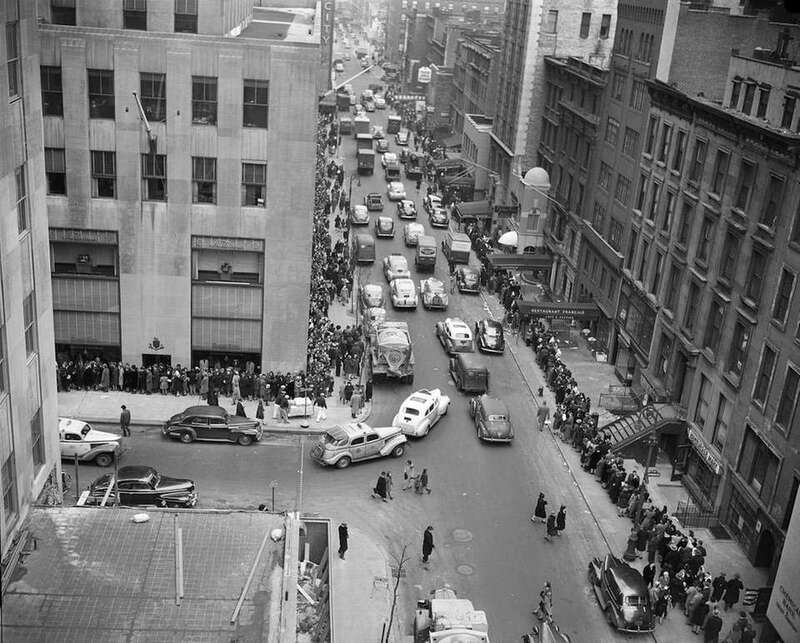 An estimated 4,000 people line both sides of 51st Street waiting to see a Christmas show at Radio City Music Hall on Dec. 27, 1945. 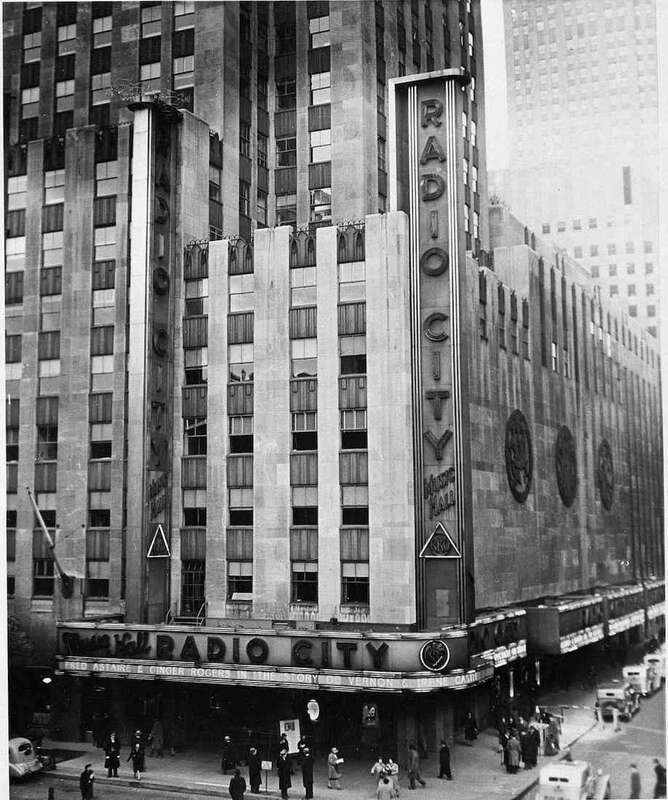 Radio City Music Hall, which once was well lit, has its exterior lights almost all out on May 20, 1942, with practically no traffic outside. 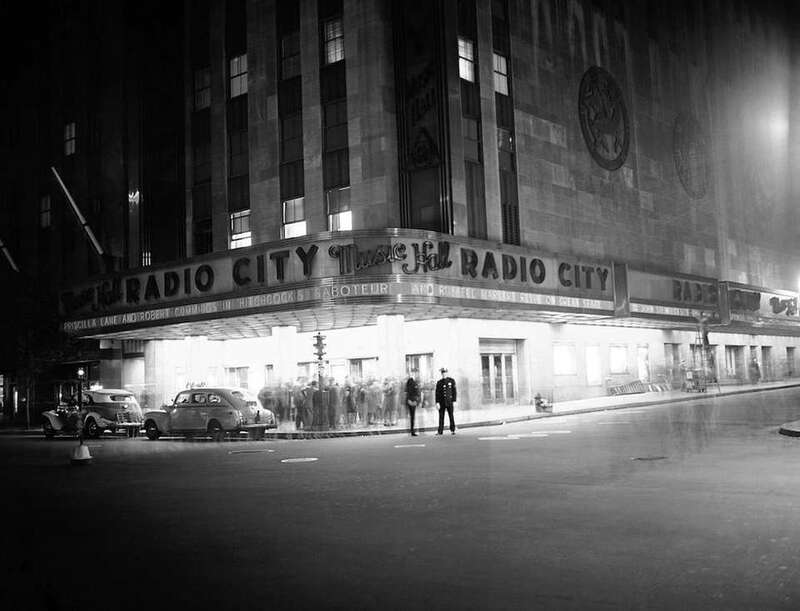 The radiant facade of Radio City Music Hall in 1939. The interior of Radio City Music Hall at Rockefeller Center in Manhattan on March 11, 1938. Rockettes' 'Christmas Spectacular' costumesConsider it a legacy of legs — and high kicks. 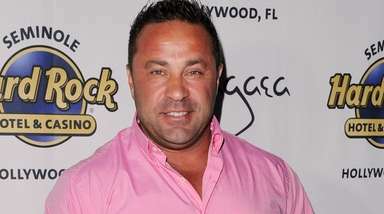 The Radio City Rockettes, stars ... 48 celebrities who've had Broadway rolesCelebrities who have taken their acting talents to Broadway.